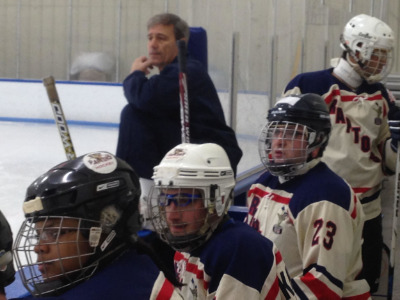 A former Pelham Civic Man of the Year, current Pelham Manor Fire Chief - and longtime Pelham resident - Joe Ruggiero is an active coach and leader in a remarkably successful program - The New York Raptors - that teaches disabled children and young adults with mental and physical disabilities who have a passion for hockey, to skate and learn the game. Thisdetermined team of challenged players overcome obstacles that were once considered unconquerable. This program is always in need of financial support, which is basically provided by the players' family members. Ice-time is expensive. Well-run tournaments for the players also takes a lot of volunteer time, and donations. The Pelham Civic Association is proud to be an annual sponsor of this program and team. On Sunday, October 25, 2015, the Pelham Civics presented Joe Ruggiero and his staff with a $2000 check to help support this magnificent program. Present for the Civics were President Joe Benefico, and Pelham Civic members Bill Taubner (who matched our $1000 donation with another $1000), and Joe Nunziata, who introduced the Raptors' program to the Civics two years ago when he and his son Anthony attended a game and got to talk with the coaches, parents and players. Each year the Civics supports Cerebral Palsy of Westchester – one of Westchester County’s most innovative and successful programs that provides essential educational services, direct services, vocational training, recreation, rehabilitation and advocacy to children and adults with cerebral palsy and other disabilities. We are also proud to have been one of the first organizations to assist in the creation of, and continual support of, The Danny Fund — a program that assists families of children with catastrophic illnesses.